Season 2012 is now officially opened as on Saturday we visited the Helsinki International Boat Show, which has become the largest boat fair in the Northern Europe. Despite the deepening financial crisis and uncertainty about the economy, there were a lot of visitors on the first day of the boat show. Corsair 750 is a foldable and trailerable trimaran which solves the common problems with trimarans related to finding a docking space. It was nice to see Najad back in business under the new owner Nord West Yachts. The 410 was one of the most impressive boats at the show. Spacious galley in Najad 410. However, the headroom was partly restricted under the cockpit. Moody 41 AC has a good space for navigator. And when at the harbour, this chart table with comfortable seats can be used as an additional dinner table. It is rather difficult to find a modern boat without double wheels and open cockpit/lowerable bathing platform. Here the cockpit of the new Grand Soleil 43. X-yachts introduced the new luxury performance cruisers Xp 38 and Xp44, which have an epoxy hull, built with the state of the art vacuum technology. 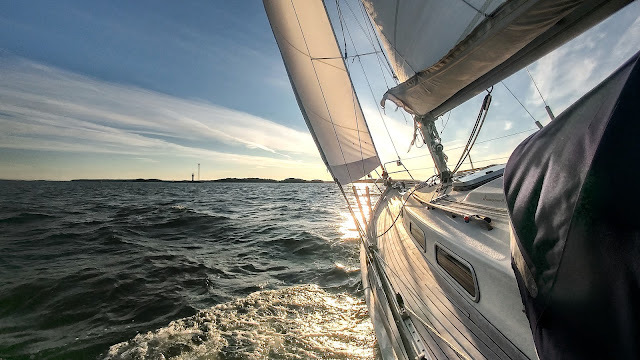 Finnish Nauticat Yachts are known of motorsailors and pilothouse sailing yachts. In Helsinki, they had their smallest boat Nauticat 321 on show. 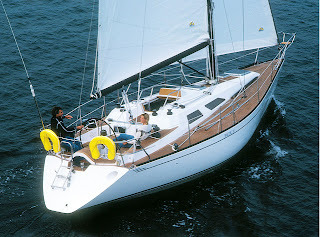 Although Nauticat 321 is only 33ft long it feels like a bigger yacht, especially on the deck.